Rocklin, J. (2011). One day and one amazing morning on Orange Street. New York, NY: Amuelt Books. One Day and One Amazing Morning on Orange Street tells a story of friendship, struggle, illness, fear, anxiety, war, aging and sadness; all woven together in a cluster of individual plots centered around each character as they deal with the conflicts in their lives. The author tells of the power of friendship and courage, as each of the characters in the book come to find compassion, strength and hope, individually and together, the story unfolds with each separate plot coming together at the end of the story as the children and adults, using their own forms of conflict resolution, find a common bond that links them together forever under the shade and history of Orange Street’s lone orange tree. In the span of only a day and a half, the reader gets to know the children who grew up on Orange Street, those who live there now and those who once lived there, as well as the history of the tree that brings them all together. In telling the street’s history, we learn of the Great Depression and the Vietnam War and the toll they took on those who lived through them. As the story opens, we discover each character’s struggle within their families, and we are introduced to a mysterious stranger who shows up early the first morning parked near the orange tree and empty lot, and of that ominous orange cone in front of the lot on the sidewalk. Mrs. Snoops (Ethel Finnymaker) called by that name because she is perceived to snoop on everyone on Orange Street, is alarmed by the orange cone across the street and calls 911 to report a crime, one that has yet been committed. She knows something is up, as does everyone else as the day progresses. Overwhelmed by their own problems, however, the characters go about the first day on Orange Street just trying to resolve the conflict they are confronted with. In the time span of a day and a half, we learn of the struggles of each resident of Orange Street. Mrs. Snoops, the keeper of Orange Street’s history, who suffers from memory loss and the effects of aging. Bunny Perkins, a quirky, oversensitive little girl, plagued by rituals and superstitions that she believes she must continue to practice in order to prevent her mother from dying in a plane crash on one of her many business trips. Leandra Jackson is worried about her grandfather who wears a pacemaker after a heart attack and of the news that her parents are having another baby. She has fears she will no longer be important and special. Ali, whose brother can’t speak since having surgery for a tumor on his brain, she is afraid he will never be able to talk or walk or be the same again. Robert Green, a loner, feeling different than the others, has been told he is developmentally and emotionally slow. He spends his days trying to impress the other children with magic tricks in a painful effort to fit in. To make matters worse, his best friend has just moved half way around the world and he misses him. We learn of a few other residents of the street, as well as Ruff, the dog, and finally the mysterious stranger, a past resident of Orange Street whose father died in the Vietnam War. We learn of all of these very special characters, as they make their way through the pains and joys of growing up. They come together, around the fragrant and historical Valencia orange tree, each of them with memories of the tree and how it bonds them together forever. This is a story of hope, of courage, of learning to work together to make a difference, in each of their lives and on the street they have come to love. The story is easy to read, threaded with emotion and history. The story is told in third person, although it is never quite clear who is telling the tale, it almost seems as though the narrator is the orange tree itself, as it tells the story from a unique position on the street; an empty lot among all of the houses. Readers will come to care about each child who grew up there and feel moved by each story. Although there is sadness, how each life touches the others, and how the children all come together at the end as they find resolution to their troubles, the reader is left with a sense of love, peace, and joy. 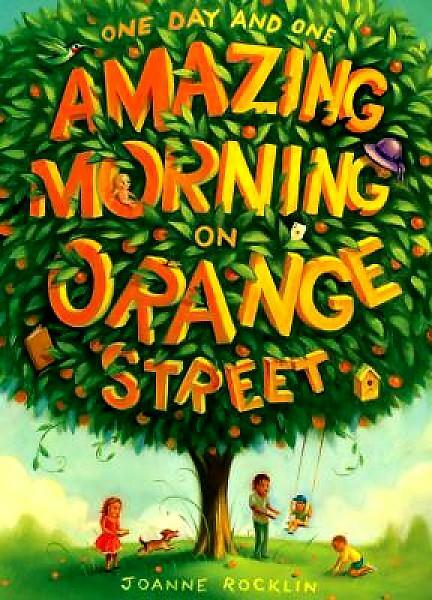 Although primarily written for a younger tween audience, One Day and One Amazing Morning on Orange Street would be a delight for all readers, boys and girls alike. It is a nicely paced story, with aspects of historical fiction. And for those who enjoyed books such as Pie by Sarah Weeks about a secret pie recipe, a cat, and a community that must work together, or The Friendship Doll by Kirby Larson about 57 Japanese girls that came to America as a gesture of friendship between their countries, the story shares of their experiences as well as the loss of 13 of them.